This week the Federal Open Market Committee (FOMC), chaired by Janet Yellen, voted to keep interest rates steady in a range of 0.75% to 1%. In the background, US economic growth, as measured by Gross Domestic Product (GDP), grew at an annualised rate of 0.7% to the end of the first quarter this year. This is the lowest rate of growth since Q1 of 2014; however, the committee commented that “slowing growth during the first quarter is likely to be transitory”. Job growth figures published last month and gradual adjustments in the stance of monetary policy signal economic activity expanding at a moderate pace. If labour market conditions continue to strengthen, then Fed predictions of a further two increases this year in interest rates may indeed be necessary to stabilise inflation at around the target rate of 2% over the medium term. Yellen offered some insight into the FOMC’s thinking with some of her remarks. For example, she said that “Household spending rose only modestly, but the fundamentals underpinning the continued growth of consumption remained solid”. This suggests that the FOMC is viewing the glass as half-full rather than half-empty. As a consequence the US 10-year treasury yield, which reflects future inflation expectations increased by 4 basis points to stand at 2.32%. 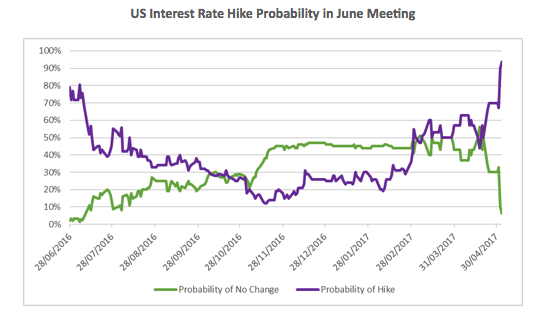 Shortly after the FOMC statement, the implied probability of a Fed interest rate hike in June’s meeting increased to 90% and currently (as of Thursday) stands at 93.8% compared to a pre-statement figure of 67.1%. There will be various reports coming out ahead of the next meeting on the 14th of June including Jobs and Payrolls for April and May, Inflation, Retail Sales and the Purchasing Managers Index. 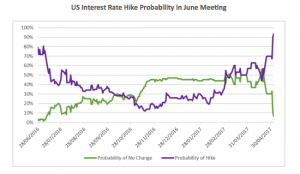 These data items will determine whether the anticipated interest rate hike will take place. 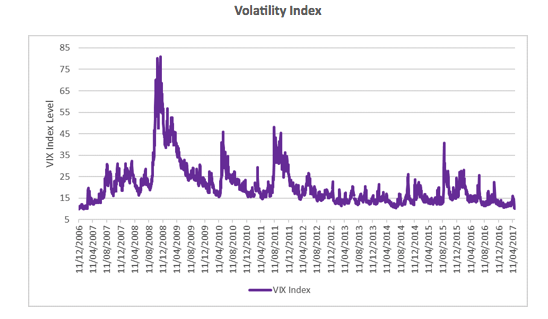 On Monday, the ‘VIX’ index, a well renowned barometer for measuring volatility hit a low of 9.9, its lowest level since February 2007. The VIX index, shown below for the US stock market, indicates that despite recent high profile and controversial events taking place in US domestic politics, and rising geopolitical tensions elsewhere, current levels remain subdued. Thus, investors remain calm by this measure. However, looking back over history this has not always been the case. 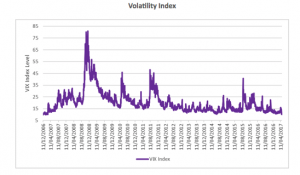 Significant spikes mark periods when volatility has risen dramatically. This is when investors fretted most about the future outlook. The clear indication from the chart below is we should always expect the unexpected. The VIX is just one of the instruments that help to determine investors’ perceptions across markets. Economic sentiment indicators in the Eurozone and US are at their highest level since the financial crisis and strong economic and labour growth figures are being exhibited across the globe. Therefore, market participants’ attitudes to risk are reflecting the generally positive economic perspective right now. The Purchasing Managers’ Index (PMI) is an indicator of the economic health of different sectors of the economy. It provides information about current business conditions and future investment intentions. The PMI level helps gauge whether activity is expanding (>50) or contracting (<50). 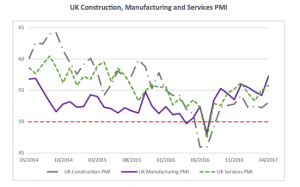 This week PMI figures for April were released showing that UK Manufacturing PMI unexpectedly jumped to 57.3 from 54.2 in March, the highest level in three years and four months. 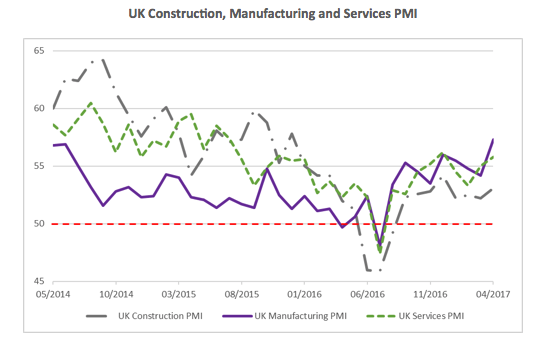 What is more, UK Construction PMI rose to 53.1 from 52.2 and UK Services PMI also increased by 0.8 to 55.8 over the month. PMI readings act as a lead indicator whereas the official GDP growth figures are a lagging indicator. GDP figures were released by the Office for National Statistics (ONS) last week showing that the UK economy experienced a slowdown in the first three months of 2017 (0.3%). The effect of higher import costs are working their way through the economy, raising inflation and squeezing consumer spending. Looking ahead though, the latest manufacturing report signalled strong demand for UK goods from the domestic market as well as overseas, continuing a pattern of export and domestic support for UK firms. This is being assisted by a weaker pound. Sterling’s sharp fall since the Brexit vote has made UK goods cheaper in foreign markets and made imported goods from overseas more expensive. The recent UK PMI figures indicate a good start to the second quarter this year with the broader economic outlook being one of expansion.